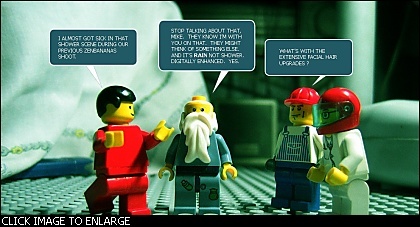 LEGO minifigs, Mike and Wilfo discuss their recent gig at zenbananas.com. Ah yes... 'a zenbanana a day drives the doctor away'. I'm contributing on the 'art' part. The class singing sessions (late student sings (yes this is a comsci class)), index card at the back info questions, how homework essay projects are scored, open book exams and a lot more of that approach... came from him. A lot of good things can be scribbled but let's leave those for another post. Going back to zenbananas.com... go check The Secrets of The Universe post. That is where Mike and Wilfo came in. And here's the link for a hi-res version of the image above.